Posted on July 17, 2012 at 5:01:41 am by Kayleen R.
You may want to think twice before throwing away that old fishing tackle in the garage. An Indiana reel, so-called because it was first manufactured in the Fort Wayne area during the 1920 through the 1940s, is especially valuable. These styles include Rider, Boyer Winona, Kuntz, Alumag. The Indiana reel’s basic design is a large diameter, single-action reel with radial arms side mounted on a rod. 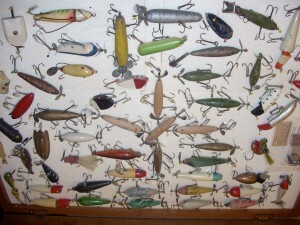 Collecting antique fishing gear is big among members of the National Fishing Lure Collectors Club, which sports 5,000 national members. 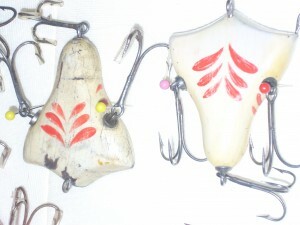 Luckily for local collectors, the National Fishing Lure Collectors Club (NFLCC) will host its national show and meeting in Fort Wayne at the Grand Wayne Convention Center, July 19-21, 2012. Attendees must be members in good standing with the NFLCC. Advance registration is $20.00 per member (price includes spouse and children). Each paid member is allowed to bring one non-guest at no cost providing the guest has never been a member of the organization. Additional guests must purchase a membership and registration. Registration at the door is $30.00 per member. International members from Japan, Canada and Europe have registered to attend the convention which will offer fans many opportunities to buy, sell, trade. Show hours are Thursday, 9:00 am to 7:00 pm; Friday 10:30 am to 7:00 pm; Saturday 8:00 am to 1:00 pm. An auction of fishing gear begins at 7:00 pm on Friday. 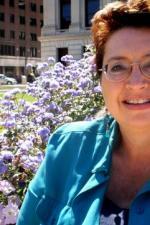 Those interested in attending the conference should contact event organizer David Saalfrank at 260.622.7107. For more information check them out online.